It’s just an organ – vital, of course – but it simply pumps blood around our circulatory systems in order that we can continue to live. If it weakens, we eventually die. Yet it’s become very much more than that in our lexicon of symbols – we speak from the heart, it’s recognised as the seat of all our emotion, it’s a big fat red velvet image pushed at us on Valentine’s Day, we use it as shorthand to indicate the difference between the rational and the emotional. What happens, then, if the heart you were born with gives up and you’re lucky enough to be given someone else’s? How does that affect you? That’s the intriguing question explored in Jill Dawson’s engrossing new novel about identity, history and the ultimate symbol . A drinker, incorrigible womaniser and negligent parent, more caught up in the chances of a quick shag than the concerns of others, fifty-year-old Patrick wakes up in Papworth Hospital, disorientated and hallucinating, to find his ex-wife Helen visiting him after his heart transplant. He’s an academic – an historian and ‘arch rationalist’ – but as he recovers he begins to speculate on the donor of his new heart, wondering if it might change him, and what those changes might be. Somehow the local press have found their way around strict hospital protocol revealing that his donor was sixteen-year-old Drew Beamish, killed in a motorcycle accident close to Littleport, the Fenland village where he lived. Dawson switches her narrative to the eighteenth century at this point telling the story of the Littleport Martyrs, two of whom were Drew’s ancestors. From there the narrative returns to Patrick alternating with Drew – Patrick reflecting on his past and planning a very different future as he makes his first forays out of the hospital, and Drew recounting his short life and what brought about his accident. There’s often an element of history in Dawson’s fiction – she’s written about Rupert Brooke in The Great Lover, Wild Boy drew on a true story about a feral boy in post-Revolutionary France and Fred and Edie was based on the story of Edith Thompson and Frederick Bywaters, hung for the murder of Edie’s husband in the 1920s. The Littleport Riots section of The Tell-tale Heart recounts an incident which took place in 1816 and although at first I was a little jarred by the abrupt turn the narrative appeared to be taking, it meshes perfectly with the rest of this many-layered, accomplished novel which deftly demonstrates how history echoes and rebounds, repeating itself in a multitude of variations, particularly in a small, almost self-contained area like the Fens. Patrick, at first an unsympathetic character, becomes easier in his skin, denying all personality changes to his surgeon while demonstrating the opposite in his actions – but then who wouldn’t after such an extraordinary experience. Dawson has Maureen, his transplant co-ordinator, rehearse the theories of cellular memory, then steps quietly aside as Patrick speculates about the new feelings he seems to be experiencing and his urge to learn more about Drew. Drew’s story is poignantly told but there’s no over-sentimentalising. It’s a work of extraordinary skill and subtlety. A few weeks ago I mentioned how little attention Helen Dunmore received in comparison to Barnes, McEwan, Amis et al, rarely unmentioned in the broadsheet reviews pages in one way or another. Jill Dawson falls into the same bracket, for me – accomplished, richly imaginative, quietly getting on with it, and thoroughly deserving of a prize or two. Maybe this will be her year. 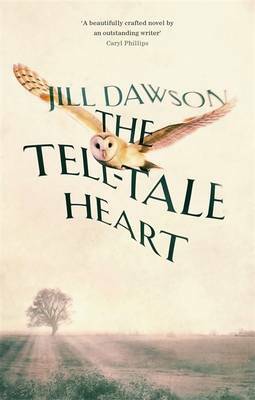 This entry was posted in Reviews and tagged British Fiction, Jill Dawson, Littleport Riots, Sceptre Books, The Tell-tale Heart on 26 February 2014 by Susan Osborne. I read Dawson’s Rupert Brooke novel, ‘The Great Lover’ and very much enjoyed it, but I’ve not come across anything else by her. Having quickly browsed your review on my phone while I was out shopping this morning I did have a quick flick through this but I’d gone to buy Anna Hope’s novel, ‘Wake’, and couldn’t really afford another hard back however interesting this sounds. Oh well, maybe next month. I do hope you enjoy Wake, Alex. I thought it was very good, and the blue/violet of the hat on the book jacket is irresistible! I’m a great fan of Jill Dawson’s fiction. I think she’s very inventive – Fred and Edie would be a good paperback alternative if you wanted one. I’ve heard of Dawson but never thought to pick up her books. I’ll look out for them the next time I’m at the library though. I’m a big fan, as you can probably tell. She’s very inventive and I like the way she uses history in her novels. I hope you find one that appeals. This does indeed sound wonderful. I’m sold!